A toe fracture is a break in a toe bone. 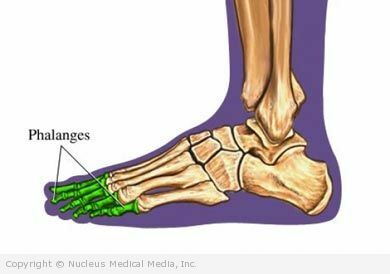 The bones in the toes are called phalanges. The doctor will ask about your symptoms, level of physical activity, how the injury occurred, and will examine the injured area. Your doctor may take an x-ray of the foot, but this is not always needed. In many toe fractures, the bone is broken but the two pieces are in proper position. If the bones are out of position, the doctor will put the bones back into place. This is usually done without surgery. However, if your fracture is severe, you may need pins or screws to hold the bones in place. Each of these will require surgery. Sometimes, the joint of the toe is injured in the fracture, and severe joint injury may require surgery. Toe fractures in children may involve the growth plates. This may require that a specialist examine the fracture. Surgery is also possible. Once the bones are realigned, they need to be held in place while healing. The fractured toe may be taped to the toe next to it, or you may need a walking cast with a toe plate. If you have a fracture, check with your doctor before taking nonsteroidal anti-inflammatory medications. Rest — Do not participate in sports or activities until your toe is fully healed. Ice — Apply ice or a cold pack to your toe for 15-20 minutes, four times a day for several days. This reduces pain and swelling. Wrap the ice or cold pack in a towel. Do not apply ice directly to your skin. Elevation — Keep the injured foot raised above the level of your heart for 48 hours (such as on a pillow). This will drain fluid and reduce swelling. Always wear well-fitted, supportive athletic shoes when doing physical activity. Wear shoes to protect your feet.